With this week’s conflicting reports of quarterback Mark Sanchez either being out for the season or, at the very least, being out for the foreseeable future, many Jets fans, myself included, have come to the conclusion that the rollercoaster of Sanchez’s time on the Jets has, for all intents and purposes, come to an end. What began with relatively high hopes and two straight AFC Championship Game appearances will most likely end with many CBS cutaways to Sanchez on the sidelines in a hat trying to look supportive of his apparent successor, Geno Smith. Flashes of his unkempt hair and seven o’clock shadow during timeouts will constitute the majority of the attention he receives here forth, and the announcers will perceive his happiness as having an inverse correlation with Smith’s success as the season progresses. Sanchez has taken the Jets and their fans to higher highs and seemingly bottomless valleys over the course of the last five years, and now that he seems to be on his way out of the city which had once been so keen to christen him as the long-awaited successor to Joe Namath, it is time to reminisce. Hopefully (I guess? Being a Jets fan is confusing, and not just for the idea of actually being a Jets fan), Sanchez will not make a Willis Reed-like return in the fading weeks of the season to bring the Jets to the brink of the playoffs and then go 5-21 with 4 interceptions and a lost fumble in Week 17. That would render this piece premature and really take some of the fun out of it. And yet, that would be a perfectly Mark Sanchez-with-the-Jets thing to do. In fact, it would simply be a perfect Jets thing to do, as this franchise loves to string its fans along with enough promise to keep the team interesting. Then, just when we think the team is ready to finally strangle the monkey on our back, the team realizes it is still the New York Jets, and we return to mediocrity under the most judgmental media magnifying glass in this country. With all that said, what follows is a look back at Sanchez’s span in New York, as told through the universal language that is pop music. I – After an up-and-down 2008 season with Brett Favre at the helm, new Jets head coach Rex Ryan elects to trade two draft picks and three players to the Cleveland Browns for the fifth pick in the 2009 NFL Draft, which they use to snag Mark Sanchez, a highly-touted (although relatively inexperienced) quarterback out of the University of Southern California. Sanchez is immediately signed to the largest contract in franchise history. By and large, Jets fans are pleased and cautiously excited for the future. II – After winning the starting job in training camp over Kellen Clemons, Sanchez leads the Jets to three consecutive victories to open the 2009 NFL season, including a 16-9 victory over Tom Brady and the New England Patriots. Finally, Jets fans have a reason to cheer and plenty of hope. III – Sanchez throws five interceptions in Week 6 against a Bills defense which had only had four all season to that point. Pundits and fans alike attribute the blemish to Sanchez’s inexperience rather than any inherent inconsistency. The Jets bounce back in Week 7 with a 38-0 victory over the Raiders, during which Sanchez is caught eating a hot dog on the bench in the fourth quarter, an act he tried to conceal. IV – When an injury causes Sanchez to miss a game against the Tampa Bay Buccaneers, the Jets find themselves sitting at 7-7 with a chance to make the playoffs. Sanchez returns for a key victory against the Indianapolis Colts, who had won 23 consecutive regular season games up to that point. In Week 17, he leads the Jets to a 37-0 win over the Cincinnati Bengals, putting the franchise into the playoffs for the first time since 2006 (who had the efficient, polar opposite Chad Pennington as a starter). He finishes his season with a statline of 2,444 yards, 12 touchdowns and 20 interceptions. V – The Jets defeat the Bengals for a second consecutive week in the wild card round of the 2009 NFL playoffs, then upset the San Diego Chargers in the divisional round en route to the third AFC Championship Game in franchise history. Sanchez plays exceptionally well, posting a 139.4 quarterback rating against the Bengals and keeping his cool against a strong Chargers defense (with help from three missed field goals by All-Pro Chargers kicker Nate Kaeding). The momentum is not strong enough to carry the Jets over the Colts for a second time, as Sanchez and company fall to Peyton Manning’s machine after holding an 11-point lead. Mark Sanchez’s rookie season ends far better than anyone could have anticipated. VI – After having surgery to repair a patella ligament injury he originally sustained at USC, Sanchez and the Jets begin the 2010 NFL season 5-1, although Sanchez experiences problems with accuracy. He records his first 300-yard game against the Detroit Lions in November. Though he substantially increases his yardage, throwing for over 3,200 on the season, his 23 giveaways hint at a possible ball control issue. The Jets go 11-5 to reach the playoffs for the second consecutive season, and Sanchez is credited with managing games coolly on the backs of strong rushing and one of the NFL’s best defenses. VII – Despite playing below expectations, Sanchez and the Jets keep the wild card game against the Colts close. Minutes after blowing coverage on what had been the most important play of the game to that point, Antonio Cromartie has a stellar kickoff return to set up a game-winning drive, capped off by Nick Folk’s 32-yard field goal in the closing seconds. The next week, in the divisional round, the Jets ride a 3-touchdown performance from Sanchez to a shocking victory over the New England Patriots, giving way to one of the greatest moments in televised interview history. Actually, forget the hyperlink. I’ll go ahead and embed it. Anyway, Sanchez leads the Jets to the AFC Championship Game for the second consecutive year in just his second year in the league. Their opponents, the Pittsburgh Steelers, ride a strong performance from Rashard Mendenhall and a dominant first-half to a 24-19 victory, despite the Jets’ late comeback attempt. Sanchez has the much better day of the quarterbacks, going 20-33 with two touchdowns and no interceptions to Ben Roethlisberger’s 10-19, no TD, 2-INT performance. The future continues to look brighter than ever for the New York Jets, whose strong running game and defense provide the platform for Sanchez to grow comfortably. VIII – The 2011 NFL season begins slowly after Sanchez is named a team captain. The Jets’ offense struggles with a transition away from primarily running the ball, and offensive coordinator Brian Schottenheimer receives criticism for his handling of the team. Sanchez misses the playoffs for the first time in his tenure with the Jets despite having his best season yet, throwing for over 3,400 yards with 26 touchdowns and 18 interceptions as well as 6 rushing touchdowns. IX – After the addition of quarterback Tim Tebow, who had led a game-winning drive for the Broncos the previous regular season against the Jets, New York’s offseason plays out with a circus-like atmosphere. ESPN and other media outlets heavily scrutinize every practice and workout, and fans question Tebow’s intended role on the team. X – The 2012 NFL season begins smoothly for the Jets, who systematically dismantle the Buffalo Bills by a score of 48-28. Sanchez has three touchdowns and a single interception on 19-27 passes for 266 yards. Over the next four games, however, Sanchez fails to complete more than 50% of his passes and begins to feel the pressure of Tebow behind him thanks to constant chatter surrounding their coexistence. 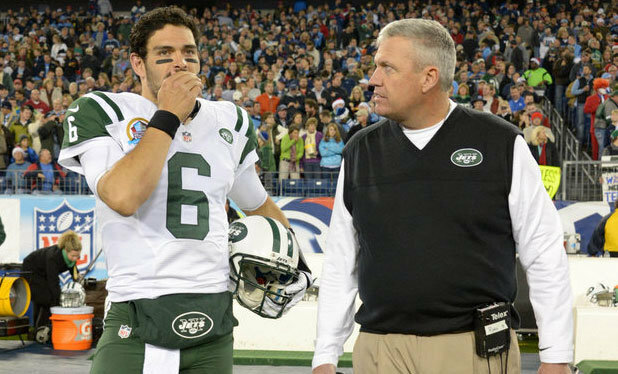 Head coach Rex Ryan sticks with Sanchez through the team’s struggles, even as fans and media outlets call for Tebow’s insertion into the lineup. XI – The Jets go 4-6 in the first ten games of the season, setting the foundation for a key Thanksgiving game against the New England Patriots, who had narrowly defeated them in overtime earlier in the season. After holding the Patriots scoreless in the first quarter, the Jets give up 35 points in the second, punctuated by a turnover in which Sanchez fumbled the ball after running into his own offensive lineman and had it returned for a Patriots touchdown (almost unbelievably, this single, infamous play has its own Wikipedia entry that is longer than the one belonging to SportsCenter anchor Kevin Naghandi. I only say “almost” because, as we know, this is the New York Jets). XII – Sanchez starts the following week against the Arizona Cardinals but is benched in the third quarter after throwing three interceptions. Rex Ryan passes over Tebow in favor of third-string quarterback Greg McElroy, who leads the Jets on their only scoring drive, which is capped off by a touchdown pass to tight end Jeff Cumberland. The Jets win the game 7-6. XIII – Sitting at 6-7 and with a slim chance to make the playoffs, Rex Ryan sticks with Sanchez against the Tennessee Titans. Sanchez responds to the must-win situation with four interceptions and a key lost fumble, sealing the Jets’ season a week early. To make matters worse, Ryan names Greg McElroy the starter for the final game against the Buffalo Bills before McElroy reveals he has concussion-like symptoms, causing Sanchez to start again. The Jets lose the game 28-9, with Sanchez turning the ball over twice. XIV – The Jets take West Virginia quarterback Geno Smith in the second round of the 2013 NFL Draft, causing some to wonder if Sanchez’s job is in jeopardy despite Ryan’s continued presence and his history of standing behind Sanchez. A quarterback competition ensues in training camp, and throughout the preseason it does not appear that there is a clear-cut starter despite Sanchez typically playing with the first string unit. XV – Rex Ryan picks Geno Smith to start a preseason game against the Giants. When Sanchez comes in to play the second half with reserve units, he suffers a shoulder injury, and many pundits and fans question Ryan’s decision making if, in fact, he had chosen Sanchez as the starter. Initially thought not to be serious, Sanchez’s injury sidelines him at least for the first part of the 2013 NFL regular season, and Smith leads the Jets to a victory over the Tampa Bay Buccaneers and a narrow loss to the Patriots. Sanchez supports Smith but holds the contention that, if not for the injury, he would certainly be the starter. Jets fans everywhere begin to look to the future, which seems tentatively in the grasp of Geno Smith and finally, mercifully out of the once promising hands of Mark Sanchez.